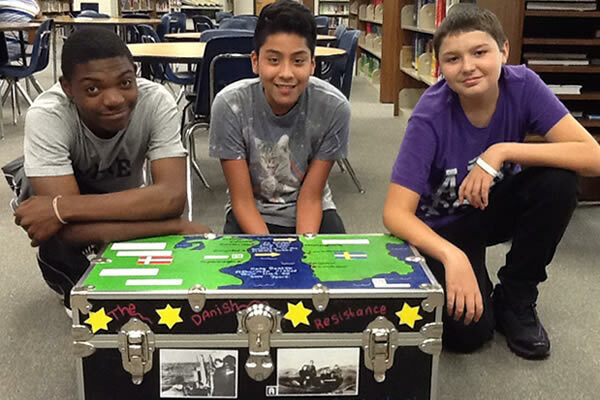 Students of Shiloh Middle School in Gwinnett County posed with a trunk they decorated. Georgia’s Holocaust Learning Trunk Project has been a resounding success with teachers and students throughout the state. The Project is a Claims Conference-funded initiative of the Georgia Commission on the Holocaust to provide middle school students with a comprehensive set of materials on the history and lessons of the Holocaust. Trunks filled with books, posters, and videos, have been sent throughout Georgia via regional educational hubs for sharing services among member school systems, which are responsible for lending the trunks out to schools. The trunks include books such as “The Diary of Anne Frank,” “Night,” “The Devil’s Arithmetic,” and “Maus,” as well as “Not On Our Watch: The Mission to End Genocide in Darfur and Beyond”; such movies as “Life is Beautiful” and “Schindler’s List”; and educational posters. The trunks arrived at the schools covered in pictures, posters, and signs – decorated by students from Atlanta schools. The Claims Conference has sponsored similar trunk projects in Texas, Minnesota, Pennsylvania, and elsewhere around the United States, as well as in Greece, since 2002. The Claims Conference has also funded teacher training kits with similar resources in Israel, Canada, and the United States. When the Georgia Commission began planning its Trunk Project, it looked to some of these other projects for guidance. But unlike other state agencies, which keep the trunks and administer their delivery themselves, the Commission has donated the trunks to the regional educational hubs. “They are a gift from us to the communities,” Viki said. It is a gift that is greatly appreciated. Shelly Smith, a regional executive director, said the two trunks allotted to her area’s 18 school districts were reserved months ahead of time. “It’s been tremendous. I really can’t overstate it,” she said. Shelly’s district received its trunks in during a ceremony that included an 86-year-old Holocaust survivor telling his story to students from two middle schools. His story and the trunks “made the Holocaust and the reality of it tangible for the students,” Shelly said. At Camden Middle School in Kingsland, media specialist Shan Peters wanted to maximize the number of students benefiting from the trunk in the two weeks she would have it, so she turned the trunk’s posters, books, and CDs into a walk-through exhibit in the school’s media center. “Teachers liked the fact that the posters were good visual aids,” Shan said. “The visual aspect of seeing the pictures, they felt, would stick with the students for a long time. We have a visual generation.” Students also benefited from listening to survivors’ testimonies included on a CD-ROM in the trunk, she added. The most common comment Shan received from the 850 sixth-, seventh-, and eighth-graders who walked through the exhibit was that they were glad they did not live through that time, and an understanding of their responsibility to stand up to bigotry. The inclusion of some non-World War II-centered books in the trunks has helped Sue’s students realize that genocide and prejudice still exist, Sue said. Indeed, the variety of materials in the trunks is critical, Shelly said. “The video material is crucial because students live in a digital age and if we don’t have digital materials available for students we really are not going to tap their interest,” she added. The program is geared toward middle schools, but Shelly’s district has received trunk requests from high schools, as well, which Shelly hopes to accommodate after the trunks reach every middle school. “If I had a dozen more trunks I could have them all in schools today,” she said. “They clearly put a lot of thought into their trunks and through the experience they learned valuable lessons of good citizenship, community involvement, and respect for all,” said Emma Ellingson, Communications and Digital Media administrator of the Georgia Commission on the Holocaust. Learn more about Georgia’s Holocaust Learning Trunk Project.